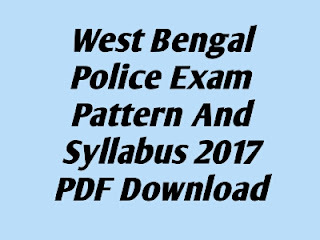 West Bengal Police Constable Exam Syllabus PDF download link provided Here.West Bengal Police department is Going to Arrange West Bengal Constable Exam 2017. Most of the students from fill up this examination. So candidates are should know about West Bengal Police exam pattern and syllabus for you better practice.Exam Syllabus is most important things for any kind of Competitive exams.For proper practice, you should know about the particular examination. Today GK Solve share West Bengal Police Constable Exam pattern and Syllabus 2017 pdf download link. You can Download pdf file just one click and free of cost.This pdf file will give you a Complete idea about West Bengal police Exam 2017, which section you have to prepare well. So Readers are requested to download this pdf as soon as possible and start proper practice. Disclaimer: This Exam pattern and Syllabus information Collect from Others Website.